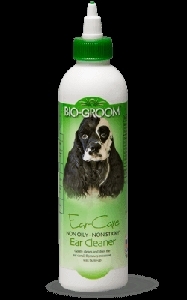 This all natural conditioning treatment helps relieve dry irritated skin. 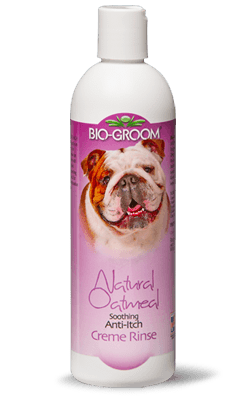 Natural Oatmeal Creme Rinse gives the coat remarkable sheen and silky feel. 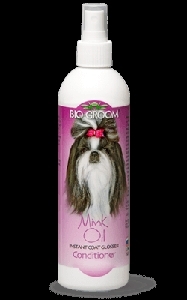 It moisturizes over worked hair, removes tangles to prevent damage from pulling and tugging. Concentrated â€“ dilute 1 part with 4 parts water. Contains: 10% Colloidal Oatmeal USP. Cruelty Free - 100% Biodegradable. 10% (RAW) Colloidal Oatmeal USP, Purified water, Stearmidopropyl Dimethylamine, Glycol Stearate, Ceteth-2, Polyethylene Glycol Monostearate, Hydroxyethyl Cellulose, Phenoxyethanol, Perfume, Citric Acid. FREE OF: Parabens and dyes.